Now that the Death Star has (finally!) begun its seasonal retreat, it’s time for us gardeners to venture forth, squinting, from our air-conditioned houses and actually enjoy spending time in our gardens again. And as we survey the figuratively charred state of our gardens and await Austin’s “second spring,” it’s the perfect time for a garden tour to grant us some new inspiration and enthusiasm. Fitting that bill nicely, this year’s Inside Austin Gardens Tour is on Saturday, October 17th. 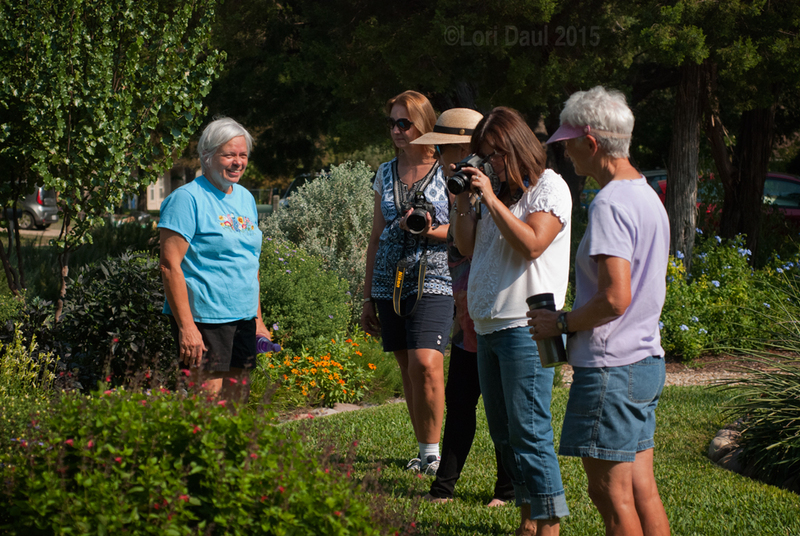 Organized by the Travis County Master Gardeners with the theme “For Gardeners, By Gardeners,” it features 6 private gardens and one public garden. The garden bloggers were treated to a preview tour this past Thursday so we could give you the scoop. 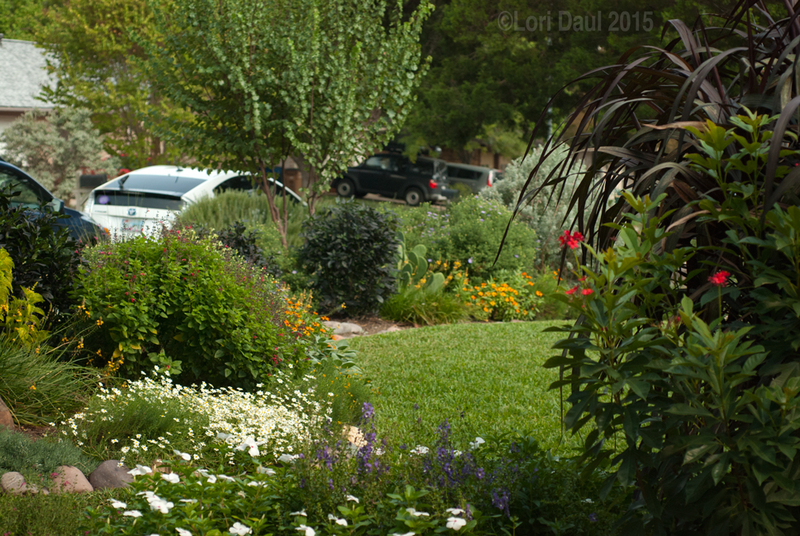 First up is the south Austin garden of Lois Pesz, which wows with lush and colorful plantings starting right at the curb. 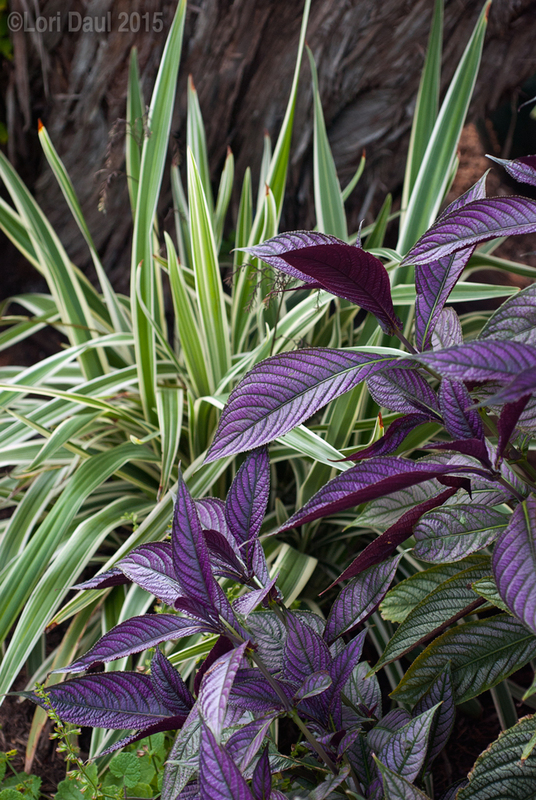 Lois favors a mixture of native plants and well-adapted ornamentals with dramatic foliage, most notably evergreen yucca, the dramatically-arching deep purple-hued “Princess Caroline” fountain grass, purple-burgundy spikes of dykia, and the glossy black-purple of ornamental peppers. The repetition of flower and foliage hues and forms unifies the front garden design. 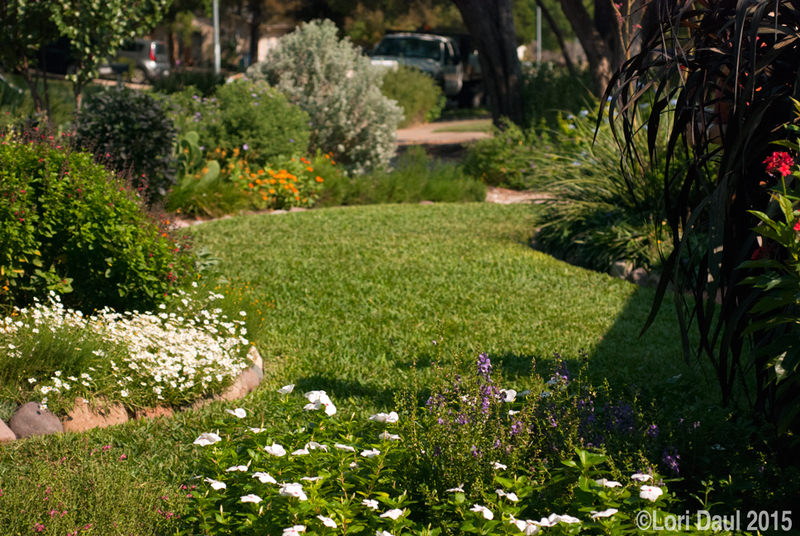 The front lawn is a gently curving wide path that creates a quiet negative space that tames the exuberant plantings. The lawn is edged with nearly invisible root barrier edging. Round rocks are set inside that border as the visible edging, creating clean lines for the lawn and greatly reducing maintenance. 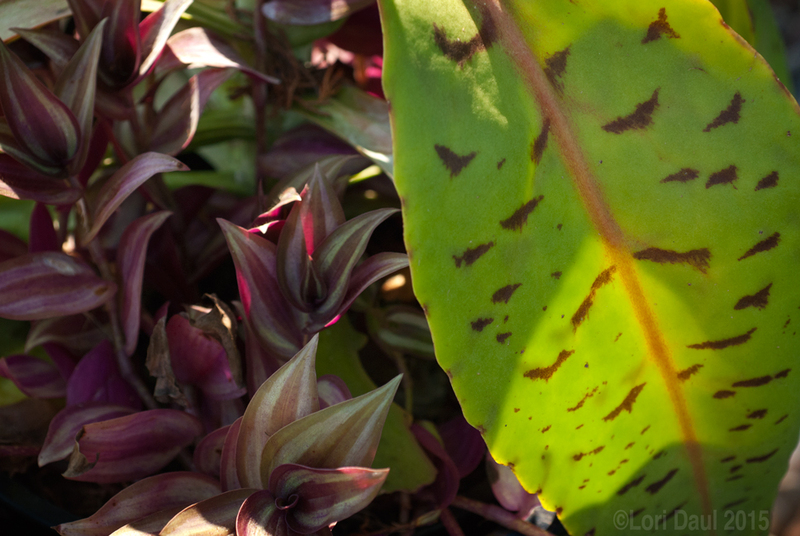 Certain color and form combinations echo each other throughout the front garden. 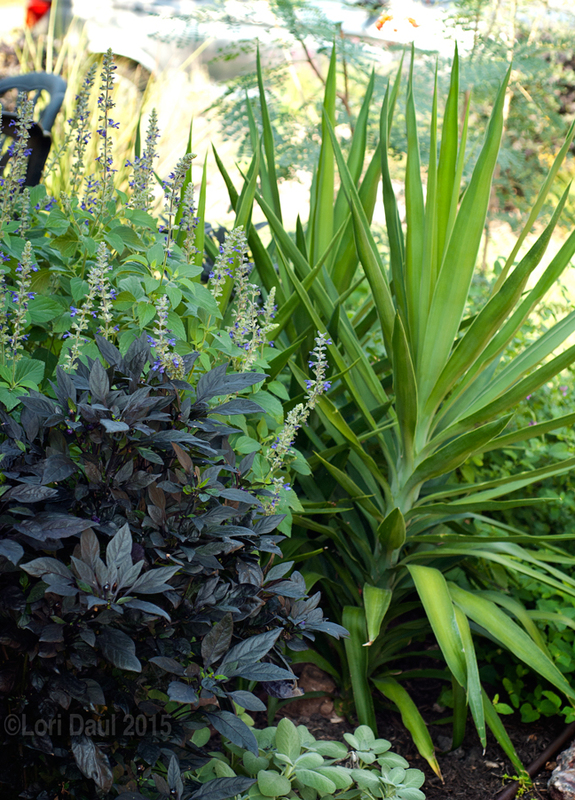 Here the purple ornamental pepper and blue-green spikes of softleaf yucca echo the shape and color of the dramatic Princess Caroline pennisetum purpureum behind it. 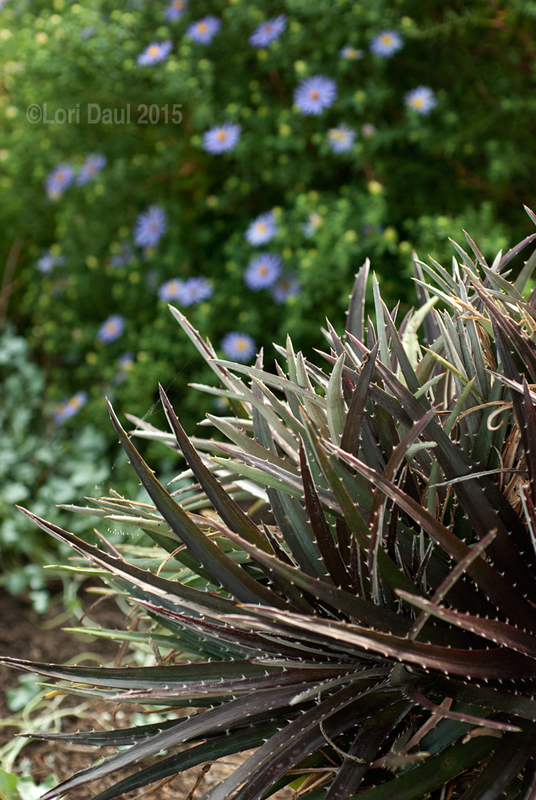 This arrangement is echoed in a shady spot with spiky-fountain shape of dianella flax lily contrasting with the dramatic purple foliage of Persian Shield. 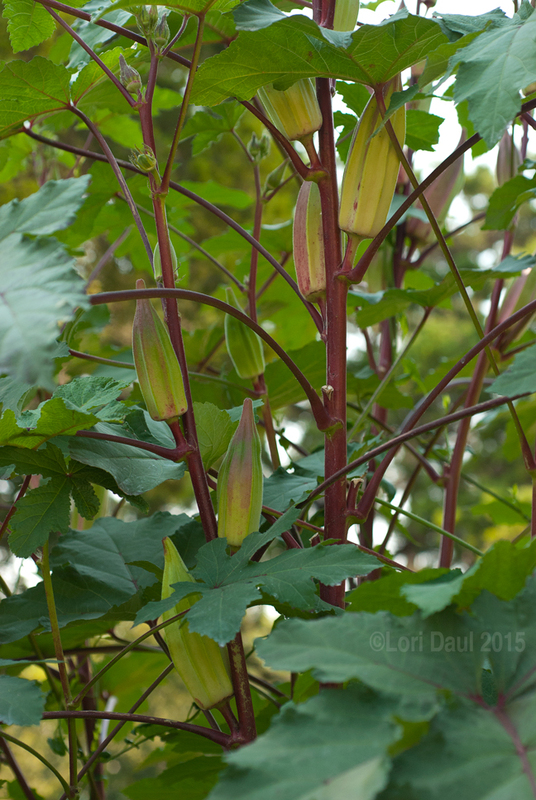 Moving to the backyard, you’re greeted with the unexpectedly dramatic foliage of giant okra. The okra provides privacy screen for one side of the back deck, which is arranged into conversation areas with comfortable furniture. A collection of potted plants brings the garden right up to the house. 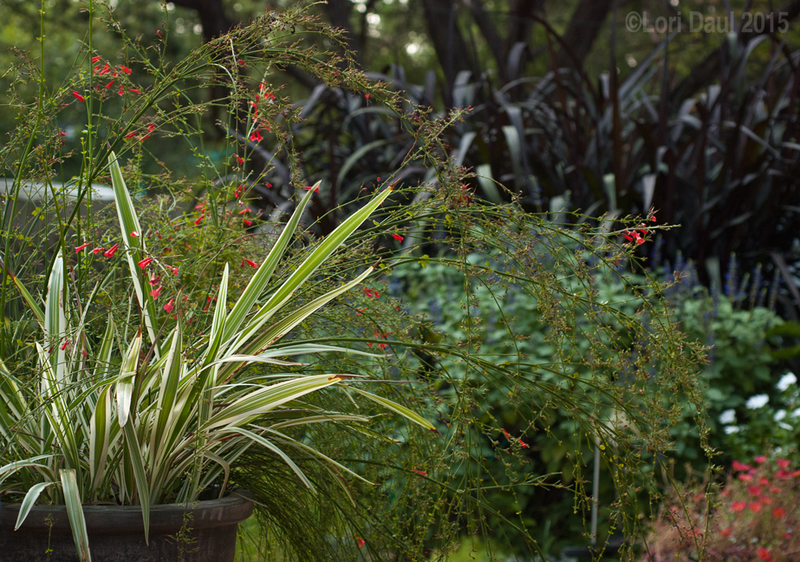 This pot features an unusual combo of dianella flax lily and firecracker fern. And who did I spy keeping a sharp eye on us bloggers? 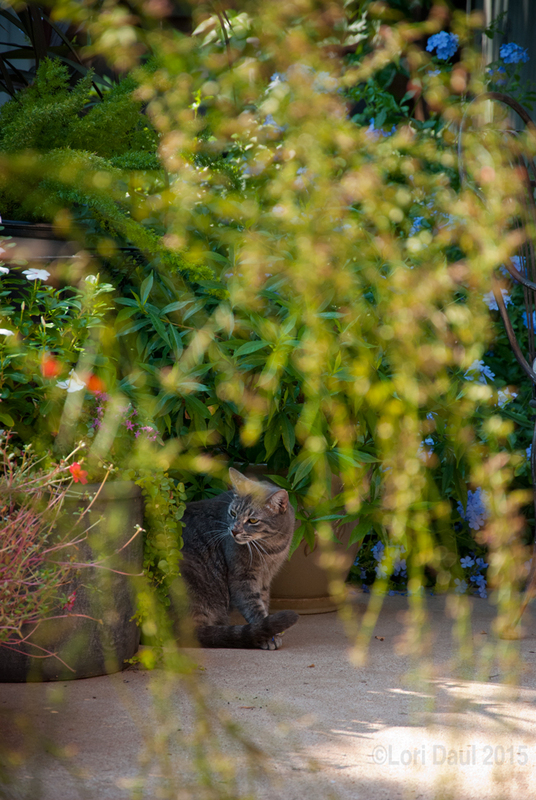 Meet Bernie, one of the garden cats. Many thanks to Lois for opening her garden for us and for answering our many questions! 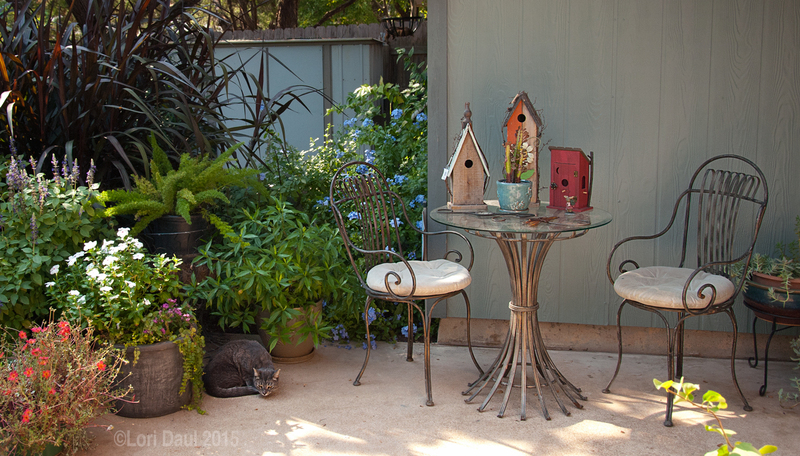 You can see more pictures and read more about Lois’s garden on the Inside Austin Gardens Tour website. 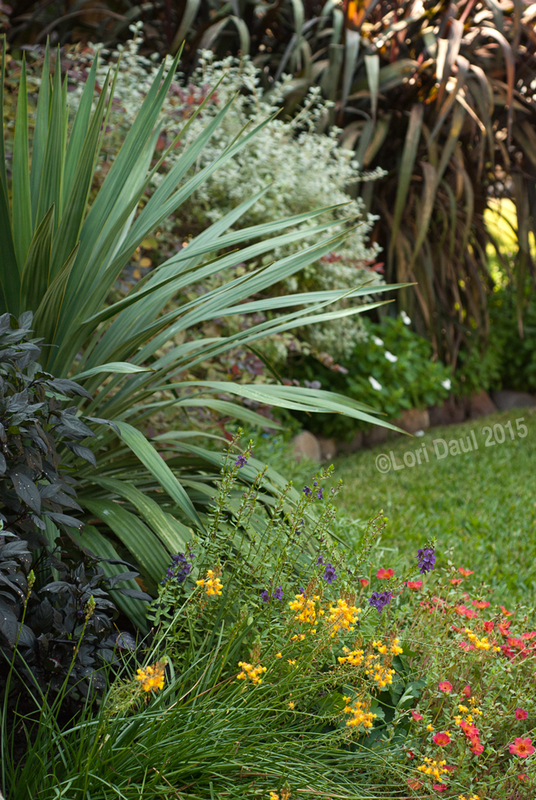 This entry was posted in Uncategorized and tagged garden tours, Inside Austin Gardens Tour, Lois Pesz. Bookmark the permalink. Lovely garden! I look forward to meeting Lois and seeing her garden. I’m sorry I didn’t get to see this garden. The hot day just got to me. I’m glad I still have the chance on the day. I think you’ll enjoy her Texas take on the English garden, Jenny! I loved Lois’s garden. Her plants are placed perfectly. The spacing and height are perfect. Everything flows together beautifully. Somehow I’m never quite able to achieve that look. Oh well, I’ll look back at my photos of her garden for future guidance. You could seriously teach a planting design class using Lois’s garden as an example. I am seriously tempted to start diagramming over a wide angle picture of her front border to explain why it works so well! Recovery face, plastic wrinkles without jabs and procedures is available to everyone. Chemical elements remove components of old cells. Skin quickly is updated. A face without wrinkles and signs of acne. Essential improvement of the external appearance of the skin. Rejuvenation, lifting, removal wrinkles are guaranteed. make chemical peeling invented by German workers in the 19th century. Since then, reliability operations has grown several times. Result can purchase and domestic conditions. Skin becomes smooth and light, without wrinkles, redness.